To Cite: Tafreshi M, Aminolsharieh Najafi S, Hasheminejad R, Mirfazeli A, Shafiee A. Tessier Number 30 Clefts With Congenital Heart Defects, Iran Red Crescent Med J. 2015 ; 17(3):e19078. doi: 10.5812/ircmj.19078. Introduction: Midline cleft of mandible, classified as Tessier 30 clefts is extremely rare, with less than 100 reported cases in the latest studies. Variations in severity and associated malformations have been reported before. Case Presentation: In this report, we present the first documented Iranian case of Tessier 30 with median cleft of lower lip and bifid tongue concomitant with congenital heart defects. Conclusions: We explain embryologic origin, differential diagnosis, other associated anomalies and its treatment by reviewing literature. Midline clefts of mandible and lower lip are very rare among congenital facial deformities. Until now, only 100 cases of this deformity have been reported. Couronne described it for the first time in 1819 (1). In 1976, Tessier introduced a classification for craniofacial deformity, which consisted of 30 variants. Midline clefts of mandible were classified as Tessier number 30 (2). The severity of the cleft can vary from mild notching of the lower lip or mandibular alveolus to complete mandibular, lower lip, and tongue cleavage, which extends to neck structures (1). Different malformations in other organs such as heart, limbs, and internal organs are also reported concomitant with Tessier 30 (3, 4). Because of the rarity of Tessier 30 syndrome, its variation in presentation and significant association with potentially fatal anomalies, reporting new cases of this condition is still valuable. In this case report, we present the first Iranian neonate born with midline cleft of the mandible, tongue, and lower lip classified as Tessier 30 concomitant with congenital heart defects. In 2013, a 12-hour-old Iranian boy was referred to Taleghani Pediatrics Hospital in Gorgan, Iran. The chief complaint was malformation of the lower lip and mandible. He was born via natural vaginal delivery at full term to a 41-year-old mother. His weight and height were 2700 g and 50 cm, respectively. Head circumference was 35 cm. His Apgar score at the first minute of life was 8. His parents had a consanguineous marriage with no family history of any congenital malformation. Their first child had no medical illness or anomaly. There was no history of any illness or taking any medications during mother’s pregnancy. A complete median cleft of mandible, lower lip and tongue with ankyloglossia was apparent in the physical examination. Each segment of the mandible was movable and the tongue was stuck to the cleft of the lower lip. An inferoposterior groove was also present in the midline of the tongue (Figure 1). A grade 3 holosystolic murmur was heard with prominence at the left sternal border. There were no other findings or apparent deformities in the skull, neck, chest, abdomen, genitalia, internal organs, or extremities. During the hospitalization period, the patient was admitted to the neonatal intensive care unit and received supportive care as the diagnostic workup began. Requested laboratory tests are shown in Table 1. Cerebrospinal fluid, blood, and urine cultures were all negative. aPMN = 53%, Lymphocytes = 47%. Abdominal and pelvic ultrasonography showed no abnormal findings. Transthoracic echocardiography showed a large ventricular septal defect, a mild atrial septal defect and a small patent ductus arteriosus. Because of the instability of his general condition and low weight gain during hospitalization, any surgical operation was impossible. Finally because of the severity of his congenital cardiac anomalies, the patient expired 12 days after admission. Median cleft of lower lip and mandible is a rare congenital anomaly. In some cases, the cleft of lip and mandible is accompanied by the cleft of tongue that varies from bifid anterior tip with ankyloglossia to the bony cleft margins, to marked lingual hypoplasia (5). In our case, the midline cleft involved mandible and lower lip, and the tongue was bifid with a deep anteroposterior groove. 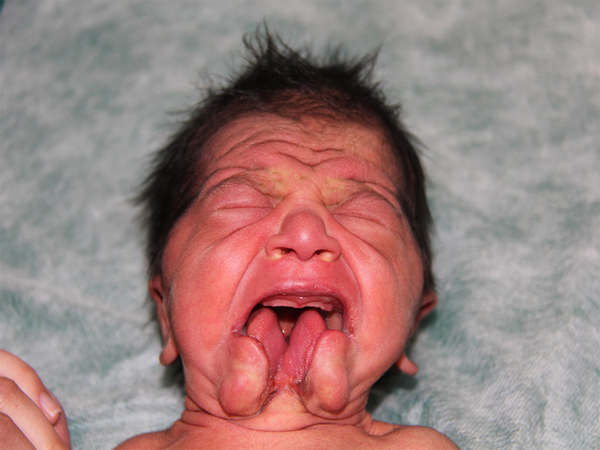 Some reported anomalies associated with Tessier syndrome include congenital heart defects (1), limb deformities (4), absence of the hyoid bone and neck contracture (6), sternal cleft, foregut duplication cysts (7), and anomalies in soft tissue structures in the neck such as the hyoid bone, thyroid cartilage, and strap muscles of the anterior neck derived from the lower brachial arch (8). In 2013, Adetayo reported a 37-week-old infant with a Tessier 30 cleft concomitant with levocardia, a perimembranous moderate-to-large ventricular septal defect, a patent foramen ovale, double outlet right ventricle, intestinal malrotation, and bilateral undescended testicles (3). In 2001, Son also presented a case with median cleft of lower lip and mandible concomitant with double inlet single ventricle (9). In our case, concurrence of ventricular and atrial septal defects and small patent ductus arteriosus was observed along with the facial anomaly. There are hypotheses over the origination of this defect during the embryonic period. Mandibular clefts may be the result of a failure in merging mandibular prominence within the first branchial arch, separated by a groove in the midline or because of the failure of mesordermal cell migration and penetration. Furthermore, the presence of growth centers in the developing mandible is essential for bone formation. Partial or complete defects of growth center differentiation may be associated with mandibular defects (1). Midline cleft of the mandible and lower lip could be one of the rare association of other syndromes such as Robinow syndrome, which presents with malformations in extremities, genitalia, vertebrae, and ribs (10) or Richieri-Costa syndrome, which involves limb defects, and could be concomitant with mandibular and lower lip cleft (11). In our case, there were no other malformations. The prenatal diagnosis of Tessier number 30 malformation via ultrasonography at 17 weeks of pregnancy period was reported by Kavak in 2014 (12). According to maternal age of presented case, we recommend obstetricians consider ultrasound examinations for detecting these anomalies in old maternal age pregnancies. The technique for treating this anomaly does not have many variations; previous reports suggested release of the tongue in the early stage of life and repair of the other soft tissues, including bifid tongue and lower lip via Z-plasty. There is a controversy over the ideal age for mandibular cleft treatment, but many studies suggest the age range of 6 to 12 years old, to prevent damage of the tooth buds during mandible construction. Mandibular defect construction involves repairing defect using grafts obtained from ribs, calvarium, or iliac crest, and fixing the graft in its position using wire, screw, or miniplates (5, 13). In summary, we have presented a case of Tessier 30 concomitant with heart defects. It was the first documented case of Tessier number 30 in Iran. Based on the previous reported cases, this anomaly is curable and can be repaired by surgical reconstruction. In our case, the severity of associated anomalies worsened the neonate’s prognosis and physicians lost the opportunity to administer life-saving interventions. Thus, these cases should be initially assessed for more severe and fatal concomitant anomalies. In addition, by using new advances in prenatal diagnosis physicians have the chance to decrease complications and plan for appropriate actions. The authors sincerely thank Mahin Nomali at Golestan University of Medical Sciences, Gorgan, Iran for her thoughtful review of this manuscript.